Fifty-seven per cent respondents of the India Today Political Stock Exchange feel, despite the hype, Priyanka's entry into active politics won't help very much. Who it could hurt is a surprise. Only 27 per cent people in the state of Uttar Pradesh think that the ‘Brahmastra’ the Congress party has launched against its political opponents in India’s most populous state will have an impact on the ground. As opposed to this, 57 per cent respondents of the India Today Political Stock Exchange (PSE) feel that Priyanka Gandhi’s entry into active politics won't help the party's revival in the state — which elects 80 MPs for the Lok Sabha. The Congress’ move to introduce Priyanka Gandhi in the electoral fray was seen by many as the party’s masterstroke, reflecting its intent to go the whole hog in the politically crucial state. However, though Priyanka has popular appeal, she doesn't come with much political experience as she has only campaigned on and off for her mother Sonia Gandhi and brother Rahul Gandhi in their constituencies, Raebareli and Amethi respectively. 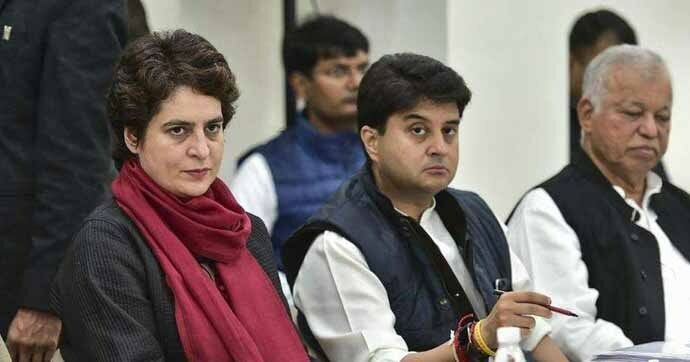 Priyanka took charge as the All India Congress Committee (AICC) general secretary responsible for eastern Uttar Pradesh on January 23, the same day Jyotiraditya Scindia took charge of western Uttar Pradesh. 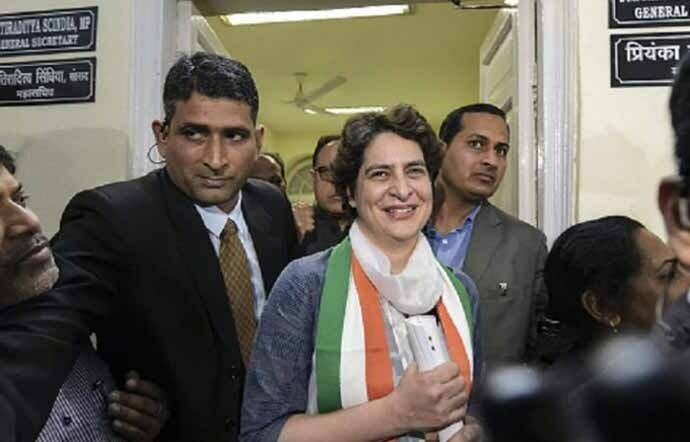 Priyanka has been made in-charge thus of 43 out of 80 Lok Sabha seats. Prime Minister Narendra Modi’s Parliamentary constituency, Varanasi, and UP Chief Minister Yogi Adityanath’s stronghold Gorakhpur fall in the region. Political experts, however, say that Priyanka’s actual contribution will be seen in the revival of the Congress cadre in the state, where the party was reduced to a mere two seats out of 80 — Amethi and Raebareli — in the 2014 Lok Sabha elections. Again, in the 2017 Assembly elections, the party won just seven seats out of 403 constituencies that went to the polls. The back-to-back losses and the lack of a strong leadership in the state left the cadres dejected, their morale apparently floundering in a region that had been the Congress’ bastion till the mid-1980s. The party cadre has since long been demanding that the charismatic Priyanka Gandhi make a formal entry into the party, instead of confining her role to managing Sonia and Rahul’s backstage campaigns. Her foray into UP is thus expected to re-energise the cadre and prepare the party for a longer future in the state. So, what is it that Priyanka’s entry is actually likely to do in the short term? 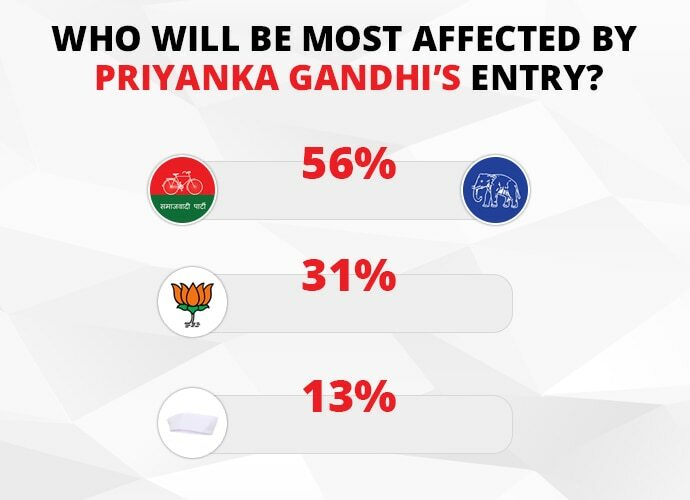 Asked which party would be the most affected by Priyanka Gandhi's political plunge, 56 per cent named the Samajwadi Party-Bahujan Samaj Party combine — 31 per cent respondents felt it would impact the ruling BJP. (The PSE survey was conducted between January 29 and February 6 via telephonic interviews at 80 Parliamentary constituencies of Uttar Pradesh. The poll had a sample size of 8,442). Also read: What do Priyanka Gandhi, Benazir Bhutto and Hillary Clinton have in common?